Aubrieta Rock Cress Whitewell Gem Aubrieta Hybrida is a popular, evergreen perennial ground cover. The Aubrieta seeds are easy to germinate, and once established this Rock Cress blooms with myriads of small, fragrant, purple to violet flowers over a dense mat-forming grey-green colored foliage. The evergreen foliage provides good coverage, and the fragrant blossoms appear in spring and summer attracting butterflies and bees. 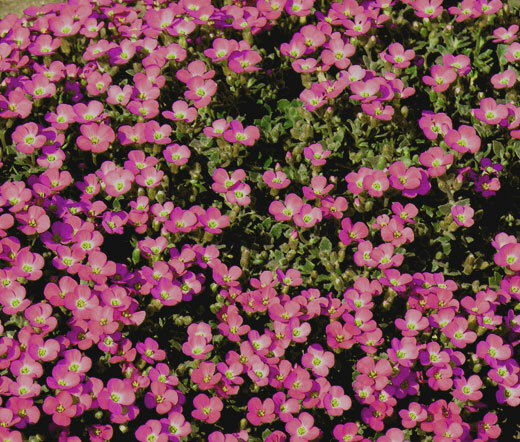 Aubrieta Rock Cress Whitewell Gem is marvelous in mass planting as a flowering ground cover. Rock Cress looks spectacular in rock gardens or alpine containers, and since the plant can tolerate light foot traffic, Aubrieta can be planted between stepping stones. Aubrieta Hybrida is drought tolerant, and it does well in full sun or partial shade.